Highly engaged employees and the workplace. 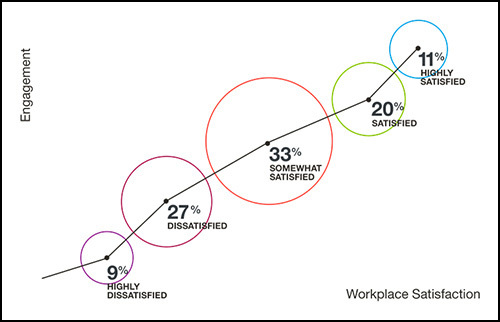 What are highly engaged employees saying about the workplace? As a follow up to Gallup’s Worldwide Engagement Survey, the Steelcase research team conducted a small study with Ipsos to explore the correlation between highly engaged employees (11% according to their study) and workplace satisfaction, polling 10,500 workers in 14 countries throughout the world. The results showed that creating the right work environment can make a difference and showed a correlation between how people feel about their workplace and their degree of engagement. In other words, the researchers learned that employees who feel good about their workplace also tend to be more engaged. So, now that you know what highly engaged employees are saying about their workplace, how can you improve yours? Team Red Thread runs the Ragnar Relay! Top 8 considerations when planning strategic workplaces.